We are one of the coveted organization, engaged in offering a gamut of Air Turbo Ventilator. These ventilators are widely appreciated in the industry for its high efficiency turbine air ventilators and energy efficiency system. All these ventilators are widely used in industrial work places for removing fumes, gases, and heat generated by the machinery. Moreover, these ventilators are manufactured using superior quality raw material in compliance with international quality standards. 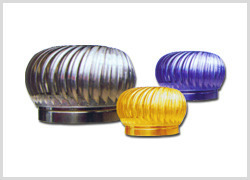 We offer these ventilators in varied shapes and sizes as per the clients requirement. 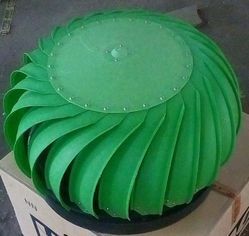 Our company is engaged in manufacturing, trading, and supplying a plethora of SS Air Ventilator. These ventilators are well known in international market for their features such as anti-pulverization capability, anti-corrosive nature, and good tenacity. Manufactured using quality-assured raw material which are sourced from reliable vendors in the market. Moreover, these ventilators are highly resistant to UV rays and can utilize kinetic and potential energy concealed in the wind. The turbo ventilator offered by us are highly efficient in replacing polluted air by fresh air. Therefore, these ventilators are widely acclaimed by our international clients, owing to high durability and reliability. These turbo ventilators are developed and designed in accordance with international norms and guidelines. To ensure the diverse demands of our clients, these ventilators are stringently tested in the presence of proficient experts. The Polypropen based "WINDOP" Air turbo ventilator is more stronger & have more CFM. Less no of wings allows more air to go out making natural ventilation faster. Special double folded design of Ventilator's Wings prevents water to enter inside the shed. The Poly propen based "WINDOP" Air turbo ventilator is more Stronger. Our domain expertise has enabled us to come with a remarkable gamut of Roof Ventilator. These ventilators are manufactured using superior quality raw material and modernized machinery in compliance with international quality standards. Owing to strong features such as good space utilization, smooth finish, and easy installation, these products are widely demanded in the industry. Our clients can avail these ventilators at competitive prices. Ventilation is the movement of contaminated air from the workplace and ventilator is the device that will remove contaminated air from the workplace by the mech. & Electrical Energy, Exhaust fan & Mech. vents are traditional type ventilators. A slightest wind draft induces outward airflow by centrifugal force. This results in negative pressure inside the building. Fresh ambient air from out side rushes in to building & maintains Comport condition, This flow of current creates a continuous cycle of ventilation. Windop Air turbo ventilator developed by "Powertrac Group" based on Korean technology and it is a revolutionary concept & completely non-conventional Device. It's having self-lubricant Teflon bush and blades are fabricated with special grade aluminum or stainless steel & Venture doom made from UV based fibre glass. Ventilator having different parts like Top & Base Ring, Shaft & Axel, Turbine Wheel & Blades, Self Lube Bushing., Venture Dome, Bushing Seal etc. Windop turbo ventilator provides a safe, cool, healthier and more controlled work environment in following with proper analysis and installation process to ensure 100% effective performance. 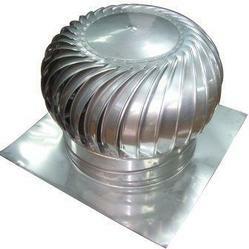 Window Air Turbo Ventilator mounting dome is mfg. from Indian UV based fibers and chemicals to withstand heavy wind load and direct sunlight. Designed to withstand winds in excess speed and Anti-block to distribute water while heavy rain. Micro balanced to avoid vibration & run in low wind. Replaces hot air, humidity, stale air, smoke & glass fumes with fresh ambient air. Increase electronic devices life, PLC, drives etc. 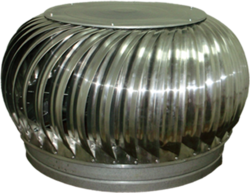 Being a customer focused organization, we are engaged in manufacturing, supplying, and trading superior quality Air Ventilator which are excellent in enhancing the life of the structure by removing humidity. These ventilators are widely demanded in the industry as they can work throughout the day without electricity. To cope up with the diverse demands of our clients, these ventilators are thoroughly examined by quality examiners at our manufacturing unit. Our patrons can purchase these products from us by paying through varied simple modes as per their ease. Working Principle: Ventilation is the movement of contaminated air from the workplace and ventilator is the device that will remove contaminated air from the workplace by the mech. & Electrical Energy, Exhaust fan & Mech. vents are traditional type ventilators. A slightest wind draft induces outward airflow by centrifugal force. This results in negative pressure inside the building. Fresh ambient air from out side rushes in to building & maintains Comport condition, This flow of current creates a continuous cycle of ventilation. Construction and Effective Operation: Window Air turbo ventilator developed by "Powertrac Group" based on Korean technology and it is a revolutionary concept & completely nonconventional Device. Its having self—lubricant Teflon bush and blades are fabricated with special grade aluminum or stainless steel & Venture doom made from UV based fibre glass. Ventilator having different parts like Top & Base Ring, Shaft & Axel, Turbine Wheel & Blades, Self Lube Bushing., Venture Dome, Bushing Seal etc. Windop turbo ventilator provides a safe, cool, healthier and more controlled work environment in following with proper analysis and installation process to ensure 100% effective performance. 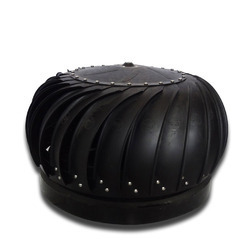 Mounting Dome: Windop Air Turbo Ventilator mounting dome is mfg. from Indian UV based fibers and chemicals to withstand heavy wind load and direct sunlight.